Kirby absolutely loves to go anywhere in the car. For him it's an adventure. It really doesn't matter if it's just to the corner store or a trip involving several hours. He just wants to GO. I learned when he was a puppy just how dangerous a loose dog in a moving car could be. Whenever he rode with me it was always in my lap. Sometimes I would hold him up so he could see out the window. He loved to snuggle up between my neck and the head rest. He could feel safe while looking out the windows. I just thought it was really cute. Then came the day I learned otherwise. Driving 75 mph on the interstate Kirby decided he wanted to get in his favorite spot. The problem was he was now nearly 15 pounds and I nearly lost control of the car. Fortunately I didn't hit another vehicle and was able to pull off the road. The next day I ordered a dog car seat. Now as soon as I grab his leash he all but quivers with excitement because he knows it's a car trip. Opening the front door of the car he will jump in and immediately go jump in his car seat waiting for us to buckle him up. This reasonably priced car seat is set up in the backseat which gives him a secure place to curl up and sleep or access to look out the windows. We have had to replace the latching hooks for the strap going around the headrest due to Kirby's weight gains but this was an easy fix. The seat comes with an attached lead to attach to his collar. We went a step further purchasing a harness vest that wraps around his chest. We felt hooking the lead to the vest may provide a safer way of containing him as opposed to yanking his neck if he were thrown from the car seat in the event of an accident. Since he has now reached his full size we plan to eventually upgrade to a larger and sturdier car seat that sits directly on the seat so he can stretch out when sleeping. The ASPCA reports there were over 30,000 pet related accidents in 2009. That's a huge number of accidents that never should have happened. We buckle ourselves in. We buckle our children in. Why would we then let our pets roam freely in a moving car? Ignorance really isn't a good answer. According to a recent AAA study, if your pet is riding in the car while you're behind the wheel then you are just as distracted as if you were texting. In fact, driving with an unrestrained pet in the car is the third worst driving distraction behind talking on the phone and texting. The study found that 80 percent of drivers admit to bringing their pets along for car rides with less than a quarter keeping them restrained. And two-thirds of the dog owners who were surveyed routinely drive while petting or playing with their pets with one in five allowing their dogs to sit in their lap. Did you know that if a 10-pound dog is loose in a car and it crashes at 50 miles per hour, that dog can exert 500 pounds of pressure endangering both the pet and anyone in its path. Legislation is starting to address this problem, but as we all know, that will take time. We can start now. 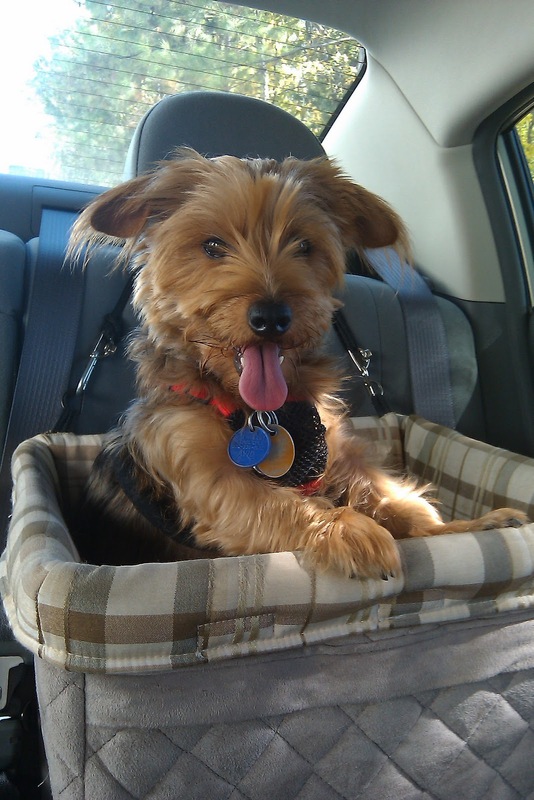 Purchase a dog car seat for small dogs or harnesses that attach to the safety belts for larger dogs. That vacation, or little trip to the corner store, won't be much fun if it ends in a tragedy that could have been avoided. I know we all have those "if only" moments in our lives. Lets make this one less event we never have to agonize over. Kirby says Buckle Up! Note: Kirby's car seat is manufactured by Solvit. He also has stairs by Solvit which he uses to get on and off my bed. We have been using these products for more than a year and highly recommend them. I don't know the maker of the vest harness which we purchased at Wal-Mart. We personally purchased these products for Kirby and are simply sharing our experience and opinion.